Sister Edith Danson RUSH ARRC, 1881 – ? “Sister Rush stirring pea soup. Very typical of how we cooked luxuries for the patients at Lemnos. The fireplace made of mud. Oct 1915″ Anne Donnell. National Library of Australia MS 3962. Click on image to enlarge. Connection to the Hunter Valley – Although Sister Edith Rush was born in Glebe, Sydney, her family moved to the Hunter when she was about nine years old. Five of here younger siblings were born at various locations in the Hunter between 1890 and 1897 so she would have attended schools in or around Newcastle and Stroud. Her next-of-kin William Rush (father), was living at Nelson Bay during the period of her war service. Her brothers Cecil and George Alfred Rush were both living in the Port Stephens area when they enlisted in the AIF. Her grandfather, whose death was reported in the Newcastle Morning Herald, 13 December 1904, p.5, had been Clerk of the Customs at the Port of Newcastle. 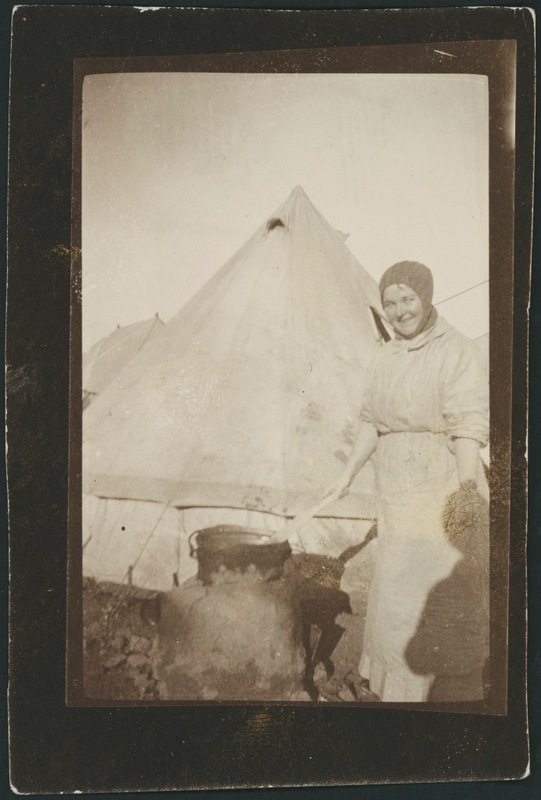 The photo above was taken by Anne Donnell, a fellow member of No 3 Australian General Hospital. Anne seems to have become a particular friend of Edith – in the northern spring of 1917 they spent their leave together on a trip to Scotland. The impression one gets of Edith from photographs and written sources is of a cheerful young woman who was good for team morale. That Edith was able to maintain such a positive attitude is the more remarkable since her younger brother George had been killed in action at Gallipoli. See Keeping spirits up for more about Edith’s war service. Anne Donnell collection of letter and photographs, National Library of Australia MS 3962 – contains three images that include Edith Rush.